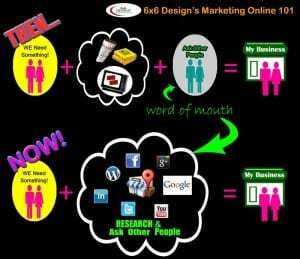 Anyone who’s ever owned a business or was looking for a product or service utilizes word-of-mouth advertising. Hands-down… it’s the best advertising money can’t always buy. No TV commercial or any other ad can beat it. The internet hasn’t changed that one bit. Word-of-mouth advertising is still as relevant as ever and even more so than before, thanks to Social Media. Here’s a little graphic that simply represents this without a lot of detail. The only thing that’s changed in the equation is the type of MEDIA people use. Word-of-mouth has never changed; just where they channel word-of-mouth has changed.